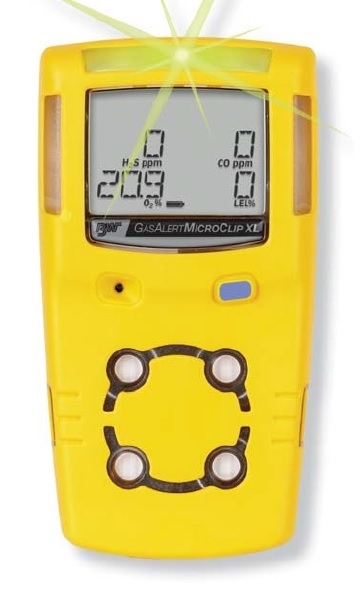 It is the same portable multigas detector that has been the number one selling Multi Gas monitor for the last 7 years but now with the benefit of a new lithium polymer battery giving an additional battery life of up to 18 hours in comparison to the 10 hours of the its predecessor the Microclip XT. This unit has been Gas Monitor Points primary multi gas monitor for the past few years due to its small design and one button operation giving the user an easy to use monitor offering personal multi gas warning in confined spaces and other hazardous areas. The easy to wear, slim and compact GasAlertMicroClip provides affordable protection from atmospheric gas hazards. For standard operation with features you can count on, opt for the GasAlertMicroClip XT. For extended battery life, especially in cold weather, choose the GasAlertMicroClip XL. Both offer visual compliance at a glance with the flashing, green IntelliFlash™. Easy onebutton operation reduces training time and lets workers focus on the job at hand. For simple, cost-effective management of your records, calibration and bump testing, choose BW’s MicroDock II automatic test and calibration system and Fleet Manager II software. Each Multigas Microclip XL monitor comes complete with a charger and 2 year warranty plus a certificate of calibration of the date you purchase. Size: 11.3 x 6.0 x 3.2 cm / 4.4 x 2.4 x 1.2 in.